This is one silly-looking machine. Really, if flying cars look like this, who will want one? I guess functionality comes first, then they can make something cool-looking. 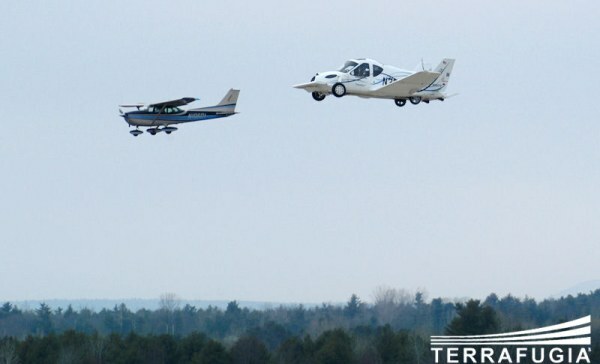 This flying contraption, called the Transition, is made by a company called Terrafugia. The idea is obviously that you have a plane you can land and then drive right out of the airport. Not sure there’s a big market for that in this economy, but maybe AIG will take a few. The Transition probably makes for a rather poor plane, being weighted down by an engine and transmission, and it certainly makes a poor car, what with the wings on the sides. Sure, they fold up, but they don’t just disappear. Plus, it is certain to get abysmal gas mileage. That said, it’s a flying car. So let’s not make it jump too many hoops just yet.